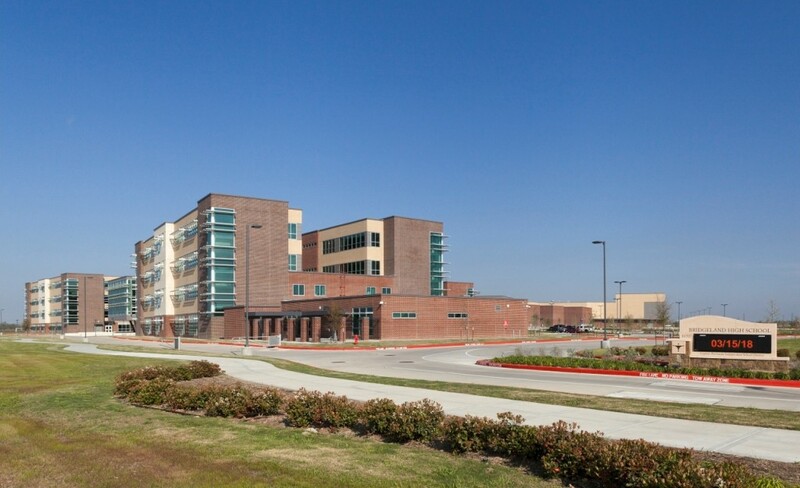 This project is the first phase of a prototype “educational village” for grades K – 12 in the Cypress-Fairbanks (Cy-Fair) Independent School District. This educational village is a multi-campus site where all schools are in close proximity to each other to create a next-generation learning community. This phase of the project included simultaneous construction of the elementary school and the high school which included a natatorium, auditorium, ballfield and press boxes on a 120-acre site. The middle school component of the “village” is to be constructed at a later date. Camarata Masonry Systems, Ltd. (CMS) was responsible for the masonry scope which included the supply and installation of 873,000 Econo King Size Brick in 3 colors (Russet, Burgundy, & Brookshire), 86,700 Burnished CMU, 19,000 Glazed Tile Base, 1.1 million CMU, 3,500 Acoustical Block, and 573 pieces of cast stone. As the masonry contractor, our goal was to safely deliver a high quality installation on the extremely large scope of work while meeting the aggressive 12 month construction schedule established by the general contractor. The project mass coupled with an aggressive schedule for substantial completion created the need to carefully predict and schedule the manpower while taking into consideration all other client commitments. The manpower provided on this project reached a peak of 220 employees and focused on the installation of multiple critical path areas at the same time. Because the site was extremely large, construction of the ballfield press boxes and dugouts was accomplished without jobsite power and only one distant water source. CMS utilized large generators for its 220v saws and portable water totes for its mixing and grouting operations. Another special circumstance faced while constructing the project was the interface of the windows and metal panels on the outside corners with the construction tolerances of the steel and concrete structure. Special attention and coordination was required to ensure that the windows and metal panels fit seamlessly. In addition, extra care had to be taken to prevent damage to the aluminum sunscreens. The hanging of the brick soffit at the entry of the elementary school presented another task that required additional attention. The solution was a specially designed concealed brick lintel system that was constructed on the ground and then hoisted into place. The project was a massive welded tubular frame scaffolding project with a large full time crew dedicated to erecting and dismantling in order to stay ahead of the large workforce. CMS was pleased to be a part of this innovative concept for an “educational village” for grades K – 12. With over 337,000 man hours worked over the expansive site, CMS experienced no lost time accidents and completed the project within the aggressive schedule required to open the schools for students for the 2017 – 2018 school year.